Local Trust - Big Local...a balancing act? People involved in Big Local appreciate the freedom the programme gives them to work towards long-term goals. However, some people feel it’s hard to get the pace right when others in their Big Local area expect quick results. This is the third of Jeremy’s blogs about residents’ experiences of Big Local. Click to read the first and second blog in the series. All Big Local areas have at least ten years to spend their Big Local £1m. What’s more, areas aren’t bound by any spending targets and have the freedom to decide when, as well as how, to use their money. We asked Big Local if they thought that this gave them the time and space they needed to plan what they wanted to do and deliver their priorities. An overwhelming majority did. However, we heard that offering Big Local areas time and space didn’t necessarily mean that the people involved in the programme were happy with the pace of progress in their own Big Local area. Although 70% of partnership members were satisfied with the pace of progress, 21% of people weren’t. And 40% of people felt pressure from their area to get results more quickly. Especially in the early phases of planning and delivering a Big Local plan, things can sometimes move more slowly than expected. In some Big Local areas, it took almost five years from being chosen as a Big Local area to having a plan in place, but this doesn’t mean that Big Local areas were not hard at work during that time. The pressure to spend fast is not from Local Trust. In our view, it’s been a continuous learning process, as Big Local areas have built their capacity to create change in their area and to manage different pressures and expectations. We encourage areas to combine ‘quick wins’ with their long term plans, and to keep their community up to date with what they’re doing, including activity that is going on ‘behind the scenes’. 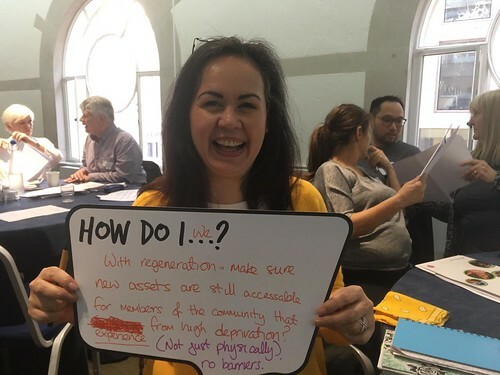 Now that all Big Local areas have progressed to delivering their plans, new challenges are arising and their needs for support and training are also changing. Like the Big Local areas, Local Trust is also learning and progressing. We’re continually looking to develop the support we provide to Big Local areas to suit the unique needs of each area. And we’re always looking for new ideas and welcome people and other organisations to share their ideas with us. Are you in a Big Local area and have experienced pressures with managing expectations of the community? Tell us about your experiences and how Local Trust can better support you. Drop us an email or contact us on Facebook or Twitter using #BigLocal. Click to read Jeremy’s first, second, fourth, and fifth blog in the series.